Over the past few months,we’ve worked on our graphing tool, which has proved to be a wonderful aid in debugging. If you want to get the best help from us in diagnosing your problems, read on. Your data will then appear in the dropdown with the name ‘pick-something’. If you don’t pick your own name, PowerDNS will use your hostname, but you might consider that to be too revealing. It might also trample existing data. Carbon travels over port 2003, and if PowerDNS can’t connect to the server, nothing is interrupted. To disable, run ‘rec_control set-carbon-server’. 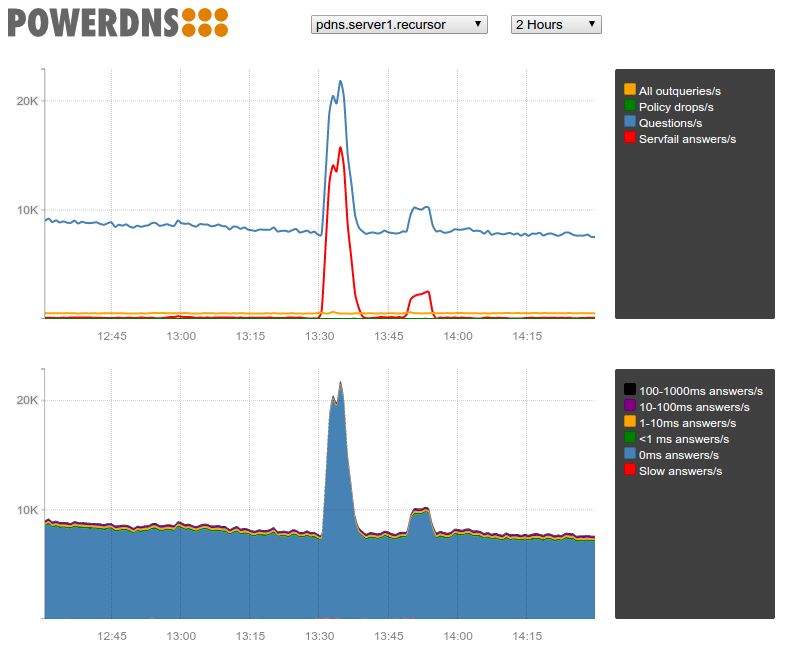 If you have any (performance) issues with PowerDNS you want help with, it is tremendously useful to turn on reporting to our Metronome instance – very often we can spot your problem from the graph quickly. Now, our public Metronome service is of course public, but you can obscure your data by picking an innocuous carbon-ourname. Private Metronome service is also available for holders of PowerDNS support agreements. Finally, Metronome is easy to install, so you can also benefit from it locally. This is very useful I think. Is it possible to send statistics to a list of two or more Graphite/Metronome server? Is there a chance to push my CPU and RAM Usage into your metronome?